Use just 3 ingredients to get these classic Pineapple-Glazed Cocktail Meatballs prepped. 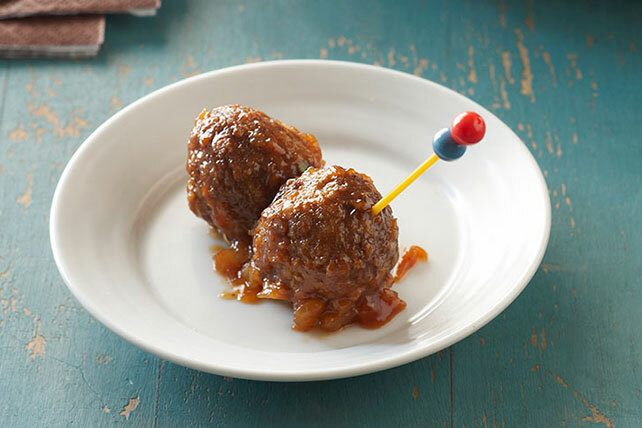 These Pineapple-Glazed Cocktail Meatballs are sweet and tangy. Mix first 2 ingredients in large nonstick skillet until blended. Stir in meatballs until evenly coated. Bring to boil on medium-high heat; simmer on medium-low heat 10 min. or until heated through, stirring occasionally. For extra kick, mix 3/4 tsp. each ground ginger and garlic powder with other sauce ingredients before stirring in the meatballs.